Saudi Arabia strongly defended its decision to arm the Free Syrian Army yesterday as Saudi Arabia and the US presented a united front on Tehran and Damascus. 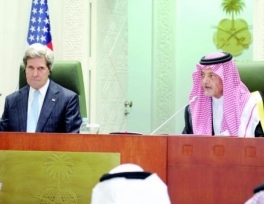 Foreign Minister Prince Saud Al-Faisal yesterday strongly defended the Saudi government's decision to arm the Syrian rebels, while US Secretary of State John Kerry pledged to "empower" Syria's opposition but fell short of backing Riyadh's proposal to supply ammunition to Syrian opposition. In a joint press conference with Kerry, Prince Saud said "Saudi Arabia has a moral duty to stop the slaughter as Syrian President Bashar Assad has lost all authority." Prince Saud called on the international community to extend help to the Syrian people to "exercise their legitimate right to defend themselves against the regime's killing machine." Kerry, who was on his first visit to the Kingdom as secretary of state, said the US will "continue to work with its friends to solve the Syrian crisis." Kerry, who arrived here Sunday night, was also welcomed by Crown Prince Salman, deputy premier and minister of defense. He later flew into Abu Dhabi for consultations with Emirates leaders. In his talks with Crown Prince Salman, the secretary of state conveyed the greetings of President Barack Obama to Custodian of the Two Holy Mosques King Abdullah. The talks were attended by Prince Saud, Prince Mohammed bin Salman, chief of the Crown Prince's court; Adel Al-Jubeir, Saudi ambassador to the US; and James B. Smith, American ambassador. Prince Salman also received Palestinian President Mahmoud Abbas here yesterday. At the press conference Prince Saud referred to the progressively growing ties between Saudi Arabia and the US and said the Kingdom and the US are in "a better position to cooperate in the political spheres and confront many regional and global challenges, which we discussed in depth at our meetings." He spoke about the age old Saudi-US ties in the field of commerce and education. For his part, Kerry supported any move or effort to help Syrian people except arming the opposition. In reply to a question about reports of arms being sent to fighters in Syria, Kerry replied: "The moderate opposition has the ability to make sure that the weapons supplied to them don't fall into wrong hands." However, he added, "there is no guarantee that one weapon or another might not fall in the wrong hands." The US has so far refused to arm rebels locked in a two-year war against Assad's loyalists. On Iran, Prince Saud said the international community supports all efforts to resolve the crisis diplomatically and ensure Iran's use of nuclear energy for peaceful purposes in accordance with procedures of the International Atomic Energy Agency. "We hope that negotiations will result in a radical solution to this crisis," he added. On the Middle East peace talks, Prince Saud said the Kingdom would exert all efforts with all friendly nations to ensure a "durable and comprehensive solution" leading to the establishment of an independent and viable Palestinian state within the framework of an independent two-state solution. 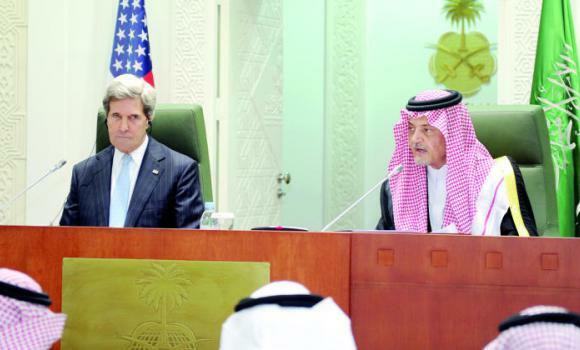 Kerry said there is need to take steps to boost the peace process. Kerry also met over lunch yesterday with Mahmoud Abbas, who flew into the Saudi capital on Sunday night. Kerry's tour does not include Israel or the Palestinian territories. In his talks with Kerry, Abbas presented the Palestinian point of view to the new secretary of state ahead of Obama's visit to Palestine on March 22. "We look forward to continuing this support and we hope that the United States will extend its support to the forthcoming London conference of Friends of Yemen,"he added.